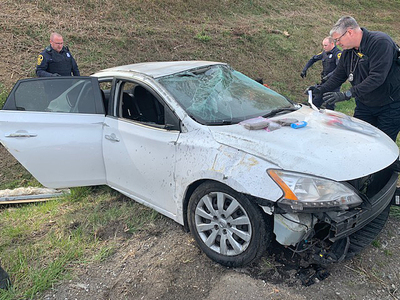 Botetourt County, VA (April 4,2 019) - At 9:30 a.m. this morning units with the Counter-Terrorism Criminal Interdiction Unit of the Virginia State Police attempted to stop a white, 4-door, 2014 Toyota which was traveling south on Interstate 81 at the 158 mile marker. The vehicle was identified as being stolen from the State of New York. When troopers activated their emergency equipment the vehicle fled a high rate of speed, driving in a reckless manner; in an attempt to get away from the troopers. Two males and a female have been arrested. Jarvis A. Sayles, 21, of Roanoke, VA, was identified as the driver of the stolen vehicle. Sayles is being charged with Driving while Suspended, Hit and Run, Felony Attempt to Elude and Possession of Marijuana. Amanda R. Valderrma, 22, of Brooklyn, NY, is being charged with Possession of Marijuana. The third subject, a male, has not been identified at this time. The unidentified male will also be charged with Possession of Marijuana.